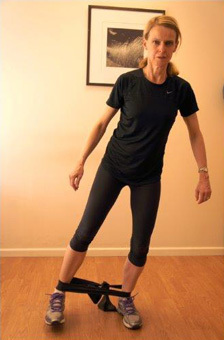 Stand on one leg, the opposite leg flexed to 90 degrees at the hip and knee. Elbows flexed to 75 degrees with the arm on the weight bearing leg in front and the other arm behind. Then extend the front leg behind straightening the knee while leaning forward from the hips and touching the floor with a straight opposite arm. You will need to flex the weight-bearing knee and you must try and keep your balance throughout. Repeat 10 times and then change legs. a) Theraband tied around your ankles, stand with your feet slightly wider than your hips and squat slightly. Then keeping the tension on the band walk forwards, there will be no knee movement. Then walk back. b) Start as above but keeping the tension on, take small side steps one way and then return leading with the opposite leg. 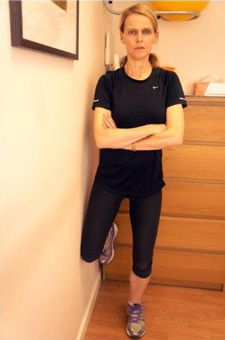 Stand side on to the wall, arms folded, flex the knee against the wall to 9o degrees but don’t flex your hip. Soften the weight-bearing knee. 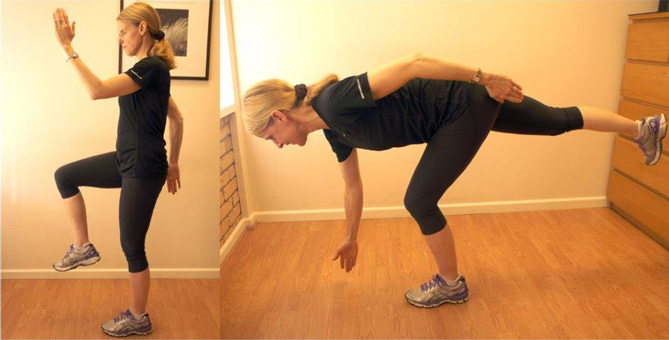 Now push into the wall with the side of the thigh while rotating out the weight bearing leg from knee and hip only. Your weight bearing foot should stay stationary and you should feel the strain on the side of the weight-bearing. Lie on your side on the floor leaning on your elbow. Then lift your body off the floor, keep your pelvis level and make sure there is no undue strain on your shoulder. Lie on your side head supported on a pillow. Lift your top leg up and slightly back keeping your knee straight. Repeat this x 20. You must not allow your pelvis to roll forwards or backwards. Progressions: a) Run on the spot quickly x10 then do a Side Star. b) Go into a SIDE BRIDGE and then do x10 Side Stars.